At Wyalusing State Park, Hummingbirds have returned. Driving through the visitor center and rolling down the window, one wonders if one of the birds will zip into the car. 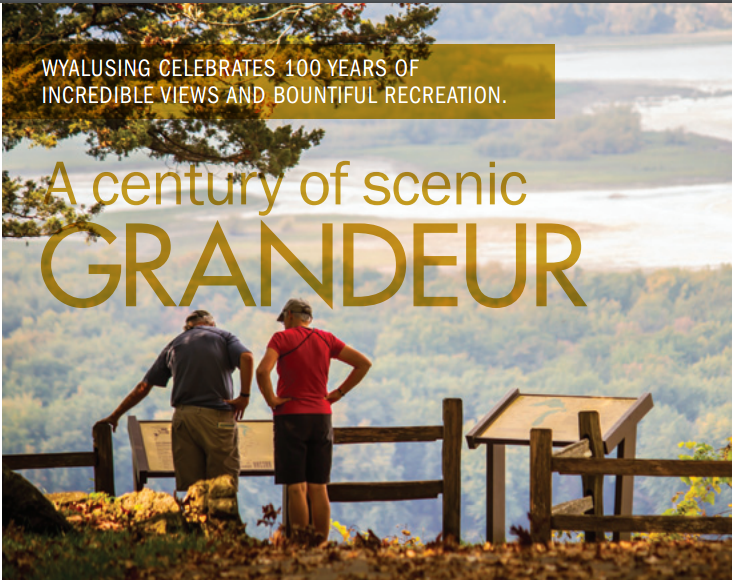 Hummingbirds' flit around the myriad of feeders hanging on the eves of the visitor center. Park visitors love to stop in the parking area and just watch the birds hover above the feeder then zip away. The most important criteria when selecting a feeder are that it be easy to clean and easy to fill. Each of the feeders is cleaned with fresh water daily. A clean feeder is a must when attracting hummingbirds. Hummingbirds will eat from anything with nectar in it, but they must be able to find it. Most hummingbird feeders have red on them because the birds seem to be more attracted to red than to other colors. If you look at the feeder in the photo at the top of this page, you will see that it is practically a beacon for hummingbirds saying "EAT HERE!" If your feeder does not have red on it, don't worry. Just tie a piece of bright red ribbon or nursery tape on it to attract them. They will explore around and find the nectar once they discover the feeder. Some feeders have perches and some do not. Hummingbirds do not need perches on feeders, but they will use them if they exist and you will get to see a special treat: a hummingbird sitting still. It is also fun to watch them learning how to do it. 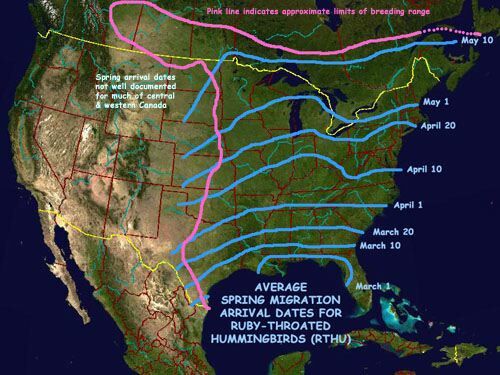 The map indicates the average approximate arrival date for the first hummingbirds of the spring season in the U.S. and Canada. Mix 4 parts water to 1 part table sugar in a pan. For example, use 1 cup sugar to 4 cups water. Do not use honey, Jell-O or brown sugar. Especially do not use artificial sweeteners. Putting hummingbirds on a diet will kill them. They burn prodigious amounts of energy for their size and need real sugar. Do not use red food coloring. It is unnecessary and can harm the little hummers even in low concentrations because they eat so much nectar. If your feeder isn't red, tie a red ribbon on it as described in the Feeders section, above. Do not add anything else that you might think of. Just sugar and water, that's all. Bring to a boil then remove from the heat. Stir it while it is heating until all of the sugar is dissolved. Don't boil it for long because that will change the ratio as water is boiled off. The reason for boiling is not to make syrup, but to drive out the chlorine in the water and to kill mold and yeast spores that might be in the sugar. This will help make the nectar last longer both in the feeder and in your refrigerator. Cover and allow to cool before using or pouring into the storage bottle. We recommend making a large batch of nectar and storing it in the refrigerator in a 2 liter soda bottle (washed thoroughly first.) This makes refilling the feeder so easy that you won't mind doing it every few days. 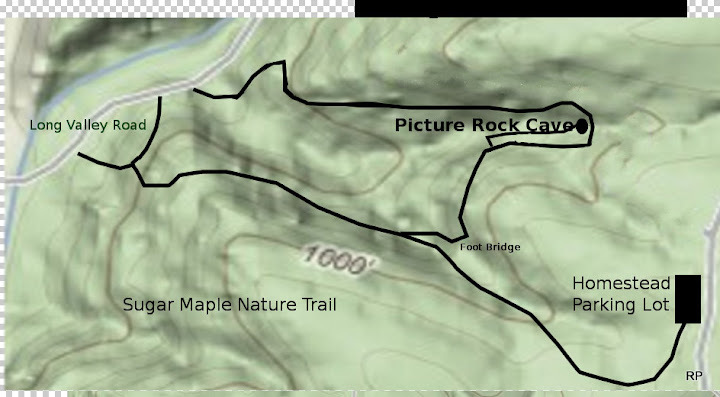 Many returning campers will often place feeders on their site. Almost all are rewarded with hummingbirds within hours.